blog about designing melanocortin analogs specific to these genotypes. nytimes blog reports that redheads experience more sensitivity to pain. 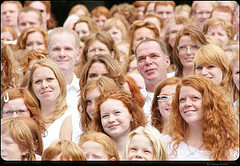 Anaesthesiology study finds that "anaesthetic requirement is increased in redheads". prevalence of the gene in worldwide groups. This page was last edited on 12 January 2019, at 17:40.